Unfortunately, some Christians view Bible translation preference and use as a test of orthodoxy. Probably the most notable example is the KJV-Only view. Years ago I met a person who doubted someone could “get saved” by using the NIV; this person also believed that the most conservative Bible-believing Christians used the KJV. From Baptist churches to Reformed churches, some people sadly make Bible translation a major issue and refuse to budge an inch. James White, The King James Only Controversy, p. 28-9. “But we must be careful to avoid making the basic error of setting up one translation as the standard over all others. Our standard must always be found in the question, ‘What did the original author of Scripture say at this point?’ We first must be concerned to know the words of Moses and David and Isaiah and Matthew and Paul; the words of the KJV translators may be important, but they cannot take precedence over the words that were the direct result of divine inspiration” (emphasis his; p. 167-169). White is exactly right. When it comes to Bible translations, we are being illogical if we start with the presupposition that a certain translation is the only perfect one. Some KJV Only advocates carry this argument out to its ugly and logical end when they say the KJV is even superior to the Hebrew and Greek manuscripts(!). And here’s another case where fundamentalism and liberalism end up holding hands: they say the Hebrew and Greek manuscripts are not trustworthy. Obviously this is not a historic Christian belief! I highly recommend White’s book for those of you who are “KJV Only” and for those of you who aren’t. White is clear, kind, logical, biblical, and convincing in this outstanding resource. James R. White, The King James Only Controversy 2nd ed. (Minneapolis: Bethany House, 2009). Baptist theologian James White’s book, The King James Only Controversy, is a great resource for those who want to study this topic. I’ve referred to White’s book on this blog more than once, showing how the militant KJV only logic is neither historically nor logically sound. Here are two more examples of this. First, White notes that many militant KJV only advocates are opposed to textual footnotes and alternate readings in the non-KJV translations. However, this position is unhistorical, since the 1611 KJV had a total of 8,422 marginal notes. The 1611 KJV Old Testament marginal note breakdown is as follows: 4,111 notes express the more literal reading, 2,156 give alternate translations, and the rest give other notes. The New Testament breakdown is as follows: 112 marginal notes express a more literal reading, 582 give alternate translations, the rest give other textual notes. Here’s how White summarizes: “KJV Only works are filled with attacks upon the modern translations for noting that certain verses are not found in ancient manuscripts or that some manuscripts read differently, yet you will search these works in vain for the same denunciation of the KJV’s textual notes. The inconsistency speaks volumes” (p. 123). Second, another argument given by White is to ask the KJV only crowd this question: “Which KJV?” (p. 124-125). White makes other solid arguments against the KJV only position in this book. I realize that probably not all of our readers are interested in this topic, but if you’ve wrestled with this or discussed this with somebody, I highly recommend it: The King James Only Controversy. One major desire of many KJV-Only groups is the desire for absolute certainty when it comes to Bible translation. James White calls it “the argument for certainty” and says that it is “the glue that holds…KJV-Onlyism together.” Many KJV-Only groups say that we must have absolute certainty in Bible translation; the KJV is the perfect translation, therefore we are absolutely certain it (and no other translation) is inspired and infallible. “It is argued that unless we embrace the KJV as our final authority, we have no final authority at all and, hence, all is subjectivity and uncertainty. People to not want subjectivity but desire certainty and clarity, and so we must hold to the traditional text” (White, 132). White gives a helpful critique of the desire for absolute certainty. “If we say that we can have no certainty regarding the biblical text unless we embrace the KJV (or the TR), we are only moving the questions one step back and hoping no one notices. How can we be certain of the textual choices of Desiderius Erasmus, or Stephanus, or Theodore Beza? How can we be certain that the Anglican churchmen who chose amongst the variant readings of those three men were themselves inspired? Are we not in reality saying, ‘I must have certainty, therefore, without any factual or even scriptural reason for doing so, I will invest the KJV translators with ultimate authority’? This truly is what KJV Only advocates are doing when they close their eyes to the historical realities regarding the biblical text (p. 133-134). In the words of Scott Clark, this is the QIRC (the quest for illegitimate religious certainty): “…to achieve epistemic and moral certainty on questions where such certainty is neither possible nor desirable” (Recovering the Reformed Confession, 39). KJV-Only groups view the KJV as the “standard by which orthodoxy is measured” (ibid.). This is a fundamentalist mindset rather than a Reformed one, since neither Scriptures nor the confessions clearly tell us which Bible translation to use. Bible translation is a matter of wisdom, prayer, and Christian liberty, not standard-of-orthodoxy-absolute-certainty matter. If you think about it, it isn’t hard to see how legalism and the QIRC go hand in hand. 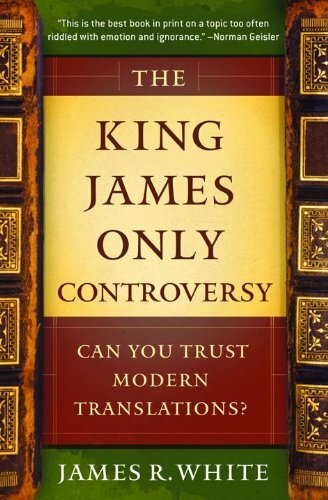 The above quotes by James White are from King James Only Controversy (Minneapolis: Bethany House, 2009).